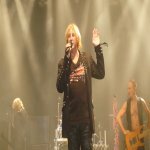 Def Leppard played a show in Skanevik, Norway on 6th July and the first fan videos have been posted online. Fans have uploaded footage from the show which took place at the Blues Festival. Watch a video of 'Let's Get Rocked' below as posted by Bmgunstead. Visit the show page to view more videos in the Fan Videos section.